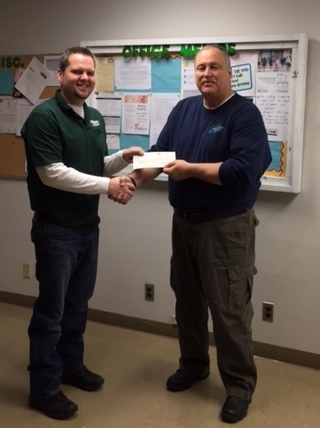 Josh Arrick, of Arrick’s Propane, Lucasville, Ohio presented a check for $17,572.37 to Larry Mullins, Coordinator of Access Scioto County Public Transit (ASC), at the quarterly ASC Advisory Board meeting on Wednesday, April 15, 2015. The check is part of a tax incentive program available from the federal government for businesses and organizations using alternative fuel to operate motor vehicles such as propane. The tax credit of 50-cents per gallon is available through the program. According to Mullins, ASC started their conversion program to operate their fleet of 10-buses on propane in late 2012. According to Mullins the transit system has saved over $55,000 in fuel costs compared to if the transit had been using traditional gasoline and diesel fuel by switching to cleaner and more efficient propane Autofuel. Mullins also said that 100% of the propane they use in their vehicles comes from our area, which means less reliance on foreign oil. Mullins added that it has been a great partnership with Arrick’s Propane that has helped us save money, protect the environment, and help the local economy.